What’s ice cream for, if not to make you feel like a kid again? While flicking through ice cream books, I asked N what his favourite ice cream flavour was. Honey ice cream, he said definitively and without a moment’s hesitation. But we’ve never had it before, I pointed out. Turns out that when he was five years old, N was pretending to be a superhero of some sort and jumping from the couch to the coffee table. Perhaps it was a bad takeoff or his little legs, but he landed just short resulting in his nose unfortunately catching the edge of the table. Lots of blood and medical calls later and after I’m sure a lot of worrying by his parents, all he remembers is that he got a tub of honey ice cream.After looking at the state of supermarket ice cream here in Sri Lanka and noticing the American commissary has been out of Ben & Jerry’s for what feels like months now, I’ve resolved to get out the ice cream maker more often. It’s not that I don’t like supermarket ice cream yeah, ok I hate supermarket ice cream. I’d rather eat really good ice cream and less of it. I researched a ton of recipes and immediately discounted the ones without egg yolks or anything claiming to be ‘low fat’. In the absence of the host of the stabilisers, home made ice cream relies on the fat in egg yolks and cream to give it that silky smooth mouthfeel. So honey ice cream it was, but with honey at premium prices here (think A$20 per 250g bottle) I couldn’t afford to make any mistakes. It’s a really good tip to make sure your ice cream base is cold before churning so I filled up my sink, tipped in some ice and put the metal bowl in the sink. I whisked and whisked and as I did, spun the bowl just enough that it tilted to the side, spilling ice cream base into the water and filling the bowl with sink water. I quickly grabbed the bowl, quite a lot of water had gotten into the mix but the honey was in there now and for the most part, the mix tasted fine… so, oh well. Hand on heart, I feel like this makes me able to promise you that this is essentially a foolproof recipe. If there’s one thing making ice cream at home has reminded me, it’s that there’s nothing more needed at a dinner party than a well made scoop of ice cream with an espresso for dessert. This is tweaked from a Serious Eats recipe – the salt rounds out the cloying sweetness and adds depth and balance. It seems like a lot so make sure to taste as you go; and use salt flakes and not table salt. 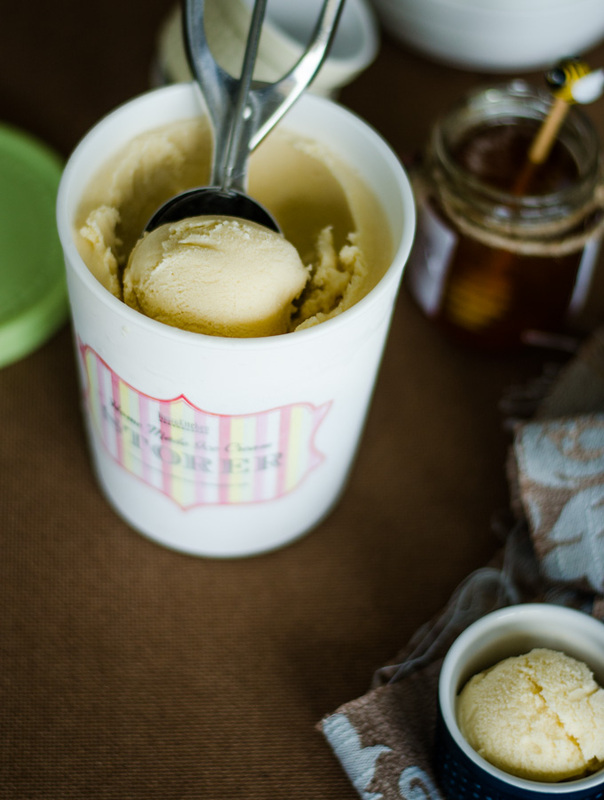 Make sure you use a honey that you like the flavour of – I really missed Aussie honey and couldn’t resist using plain old squeezy Beechworth. So, learn from my mistakes and forget about that whisking custard over a bowl of ice nonsense, assuming you’re not in any real hurry for ice cream of course… Just strain it right into a bowl, cling wrap and pop it in the fridge for a few hours to cool down. That way you don’t risk doing stupid things like I did – then again, you may not be as clumsy as I am. Another good tip if you have a self-chilling ice cream machine is to run your ice cream maker for 15 minutes to really cool down the bowl before putting the mix in there. The ice cream base will cool down a lot faster resulting in a faster churn time and smaller ice crystals in your ice cream. Heat cream and milk over medium heat until just warmed through. In a small bowl, whisk together egg yolks, honey, sugar and vanilla until thoroughly combined. Carefully and while whisking, pour the warm dairy mixture into the yolk mixture. Return the custard mixture to the saucepan on low-medium heat. Add salt, taste and add more if necessary - the salt really balances the honey and helps to cut down on the sickly sweetness. whisking continually (and making sure to get into all the edges of the saucepan) until the temperature reaches 82-85º Celsius/179-185º F. If you do not have a thermometer, the old-fashioned 'back of the spatula test' will do - dip a spatula into the mixture and when your finger swiped across the back of a spatula leaves a clean line. Pour into a bowl, making sure to strain the mixture to get rid of any accidentally cooked egg bits. Cover and chill in refrigerator for at least 4 hours before churning. Chill your ice cream maker for at least 15 minutes before pouring in the ice cream mixture and churn according to manufacturers instructions - about 40 minutes. Transfer ice cream to airtight container and chill in freezer for at least 4 to 5 hours before serving. *If you don’t have an ice cream machine, read more about how to make ice cream without it here.